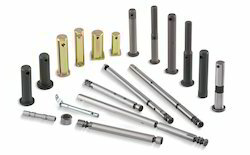 Customers can avail from us an expansive assortment of High Tensile Fasteners, which is offered in number of customized forms as per the specifications of the clients. Available in a multitude of sizes, grades and dimensions, our range of High Tensile Fasteners is admired for its dimensional accuracy and close tolerances. These high tensile fasteners have square head, square head with taper, hexagon with collar head, castle heads etc. Further shapes can also be made. - Sizes range from 16 mm to 40mm and lengths from 30 mm to 600 mm. - Surface finishes with Rust Preventive oil coating, Hot Phosphate coating, Electro-plating finishes. 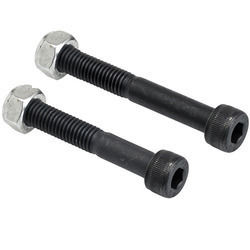 We are being counted amongst the most trusted names in this domain, engaged in providing High Tensile Fastener (High tensile Bolt). As per the needs and requirements of our clients, we are involved in providing High Tensile Fastener. We also meet the requirement of Balustrade Accessories that are manufactured using quality components sourced from authentic vendors. These accessories are durable, resistant to corrosion and have high tensile strength. Apart from standard specifications, our range is also available in customized forms as per the details given by the customers. Our company has achieved widespread recognition in offering High Tensile Fastener to the clients. This product is extensively used in diverse industries including electrical, automotive, railway, marine and engineering. Offered range is available to the clients in diverse lengths, diameters and dimensions to select from.